Fat Girl to Thin: Giveaway Time: My Favorite Things!!!! I am happy to have more than one thing to giveaway too. I thought about giving them away seperatly but I decided one Grand Prize. One Random winner will get a $10 Dunkin' Donuts card, a Glitter Head Band and a Small (not travel size) Body Glide. Let me tell you how I came up with these items. These are the three things I use almost every single day....I start every morning with a cup of coffee and since I found Dunkin' Donuts I am in love! Then everyone, everyone, everyone should workout in a glitter headband and wear it to work afterwards, and then there is the Body Glide! Again, Body Glide has no bigger fan than an overweight runner! I just love this! Just think of it like this, Before: BodyGlide ALL OVER! During: Glitter/Sparkle HeadBand and After: Cup O' Coffee! It just works out perfectly. Now who all can win...ANYONE! This includes men, you can use these products too, ok maybe not the headband but if you have a wife give it to her, girlfriends would love it too. If you don't have a wife or girlfriend, call me! And since this will be a blind draw I am letting my family play along, if they want. Even Emma who said Dunkin' Donuts was gross! Ill gladly take that card off your hands. OK...how to enter for a chance to win, let me count the ways. 1. Comment on this post. Let me know how much you want to win or your favorite color, it doesn't matter just comment and let me know you want to play. 2. Twitter: Post a comment on twitter and tag me @fatgirltothin and again let me know that you want the prize! Be sure and tag @DunkinDonuts and @BODYGLIDE cause they need to know how much I love them too. 3. #: One person will be entered to win twice, this one is totally objective and picked by me. The person with the most clever hashtag will win a second entry from Twitter! haha! I love hashtags, the funnier the better. 4. Facebook: Leave a comment on the FatGirltoThin facebook fan page. THIS IS IMPORTANT: DO NOT LEAVE A COMMENT ON MY PERSONAL PAGE!!!! IT WILL NOT COUNT! 5. Instagram: The final way is to post a fun picture (a selfy of course) on Instagram and tag me, again @fatgirltothin. Here's an example of how much I like a sparkle head band and an appropriate selfy! So that is 4 ways to enter and if you are creative with those #hashtags then you might get a bonus entry! I hope you guys are as excited about this as I am. I cant wait to give it away. You have until Monday to enter, and Tuesday I will announce the winner! Get out there and register to win!!!!! My fav color is purple!!! I really really really want to win because I love Dunkin and I'm all out of Body Glide! And green is my favorite color! Pick me!!! I never win anything and my favorite color right now is green!!! Oh and since I had to post as anonymous....this is Katie....your favorite sister 1!!!!! 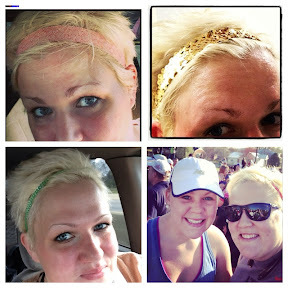 I want to win because I am starting the couch to 5k this week and have already signed up for a Color Run 5k on June 2, 2013. Love your blog, your dedication, & the BioFreeze you told me about. Would love to try other "favorites" of yours.